At our Nottingham Show Centre you will always be met with a smile and some helpful advice. The manager here is Simon, and the sales consultant, Jean, has many years of experience working for us. We are located on site with Notcutts Garden Centre, so if you're in the area, or maybe need some new gardening tools in Notcutts, be sure to pop in if you want some helpful information about our buildings. 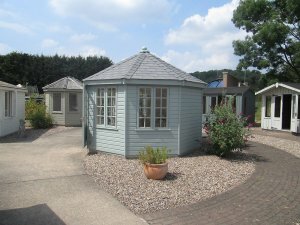 Crane Garden Buildings is located within the Notcutts Garden Centre Wheatcroft, located just outside the fine city of Nottingham and Robin Hood Country. 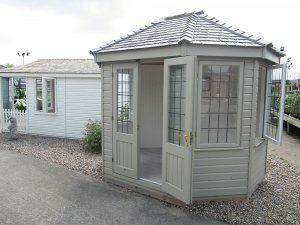 We have our full range of buildings on display, which includes Garden Sheds, Summerhouses, Workshops, Garden Rooms, Garden Offices and Studios, Timber Garages and an impressive range of high quality Greenhouses. 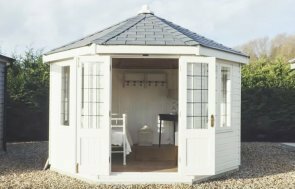 We always strongly advise any potential customers to view our buildings, to see the quality of the timber, the build and finish. 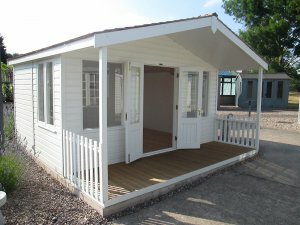 Our dedicated and friendly team will be able to work closely with you to arrive at your ideal design and building, including any base work, electrics and planning drawings that may be required. 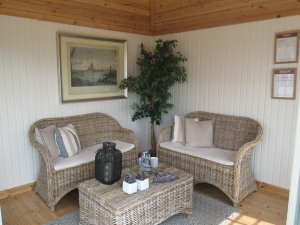 Since we are located within Notcutts Garden Centre, together we can provide inspiration for both your home and garden. To make a day of your trip to us, the city of Nottingham is only seven miles away, and if you're feeling adventurous, why don't you try following in Robin Hood's footsteps and explore Sherwood Forest? Come and visit us, you're sure to be impressed. Located just off the A52 on the outskirts of Nottingham.